By Bryan Gapinski, Sun Prairie, Wis., July 27— Austin Brown won the “78th Anniversary Night” 30-lap Zimbrick Chevrolet of Sun Prairie/Mid-State Equipment Badger Midget Series feature Sunday Night at Angell Park Speedway. Brown became the fourth first-time feature winner at the track this season. Jake Blackhurst took the lead at the start, and opened up a four car-length advantage over the Brown when the caution appeared on Lap 5 for a slowing car. Blackhurst, Brown, Tyler Thomas, and Brandon Waelti led a four-car breakaway from the remainder of the field. Thomas moved into third place on Lap 12. Blackhurst held a two-car length lead at the midway point. Brown using lapped traffic passed Blackhurst for the lead entering Turn 3 on Lap 21. Two laps later Blackhurst’s run ended when he stalled on the track bringing out the caution flag. On the restart Brown jumped to a three-car length lead over Thomas. Brown continued increasing his lead each lap, finishing two seconds ahead of Thomas who earlier in the night captured fast time, and victories in the trophy dash and heat race. Andrew Felker, Brandon Waelti, and David Gough completed top five. “This is great to finally get a victory here” commented Brown who drove the Kenny Brown Racing owned Boss/Toyota No. 7, becoming the 140th different midget feature winner in the tracks 68-year history. Norm Ehrke scored a wire-to-wire victory winning the 20-lap Badger 600 Micro Series. 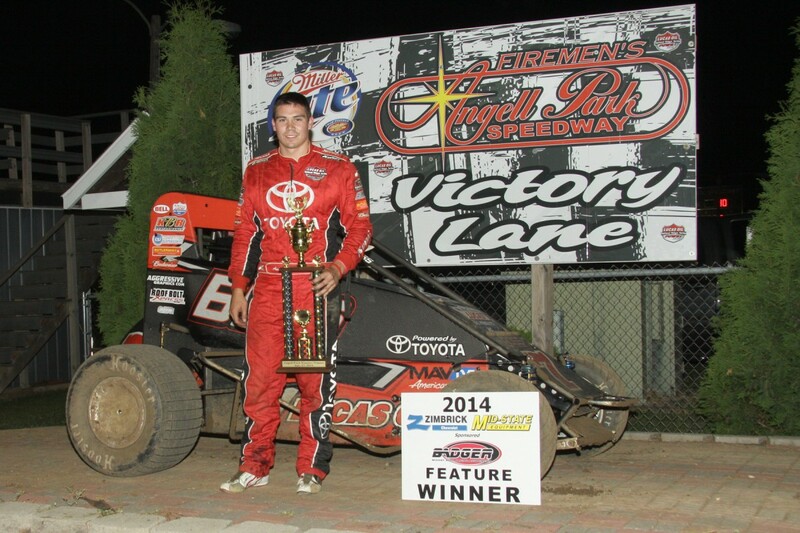 The victory was his second of the season for the Edgerton, Wis. driver. Ehrke finished ahead of Zach Boden, Matt Paderta, Jake Reif, and series points leader Brandon Sletten. MIDGETS 30-lap Feature: 1. Austin Brown; 2. Tyler Thomas; 3. Andrew Felker; 4. Brandon Waelti; 5. David Gough; 6. Kevin Olson; 7. Cody Weisensel; 8. Kurt Mayhew; 9. Katlynn Lehr; 10. Jake Blackhurst; 11. Robbie Ray; 12. Bobby Ollerman; 13. Buddy Luebke; 14. Eric Johnson. 10-lap Heat Race Winners: Thomas, Blackhurst. 6-lap Trophy Dash Winner: Thomas. Fast Time: Thomas, 14.662 seconds. Cars Present: 14 Feature Lap Leaders: Blackhurst 1-21, Brown 22-30.